Gastric bypass surgery reduces the size of your stomach and changes how your small intestine and stomach handle what you eat, resulting in you feeling full while eating less. After your surgery, the food you eat will bypass some areas of your stomach and small intestine. Here are 7 things you should know before deciding to have gastric bypass surgery, which will permanently change how you digest food. 1. What does Gastric Bypass Involve? A gastric bypass is often referred to as a restrictive operation because it restricts your food intake and it restricts the nutrients and the calories absorbed by your body. The gastric bypass decreases the stomach’s capacity and the food you eat passes into the jejunum, which stimulates changes in your stomach’s hormones leaving you feeling full. 2. What Type of Surgery is Gastric Bypass Compared to Others? The Roux-en-Y bypass (RNY) procedure – Using a small portion of the upper part from your stomach, staples are used to create a stomach pouch that restricts how much you can eat. Your bottom stomach area (blind stomach) and the pylorus no longer control food movement through the intestine. Your surgeon attaches the top stomach pouch to your small intestine so a large amount of the stomach along with the duodenum is bypassed. You will be left feeling fuller for longer. Laparoscopic adjustable gastric banding – A band with an inflatable balloon is placed around and fixed in place on the upper part of the stomach creating a small stomach pouch and a narrow opening to other parts of the stomach. Then a port is put in under the abdomen’s skin with a tube that connects to the band so fluid can be either injected or removed using the port to inflate or deflate the band, thereby adjusting its size. 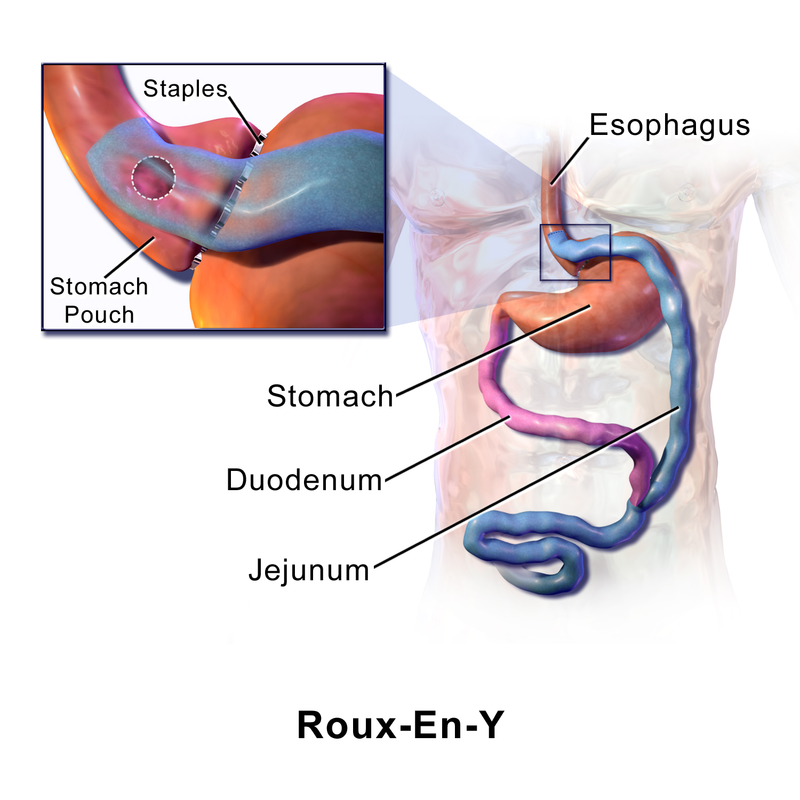 Sleeve gastrectomy – Part of the stomach is separated and then removed. The surgeon then created a tube-like structure with the balance of the stomach, which can’t hold as much food as your full stomach did. It also reduces your appetite, and it regulates hormone ghrelin so your desire to eat is reduced. However, with sleeve gastrectomy, the absorption of calories and nutrients in your intestines is not affected. Biliopancreatic diversion with duodenal switch – Your surgeon removes a large portion of your stomach, leaving the valve, which releases food into your small intestine. The intestines midsection is closed and the later part is then attached to the duodenum. The end of the intestine is then reattached to your intestine so that the bile and pancreatic juices can reach the reattached intestine. This process means that most of the food you eat bypasses your small intestine so it reduces the amount of nutrients and calories you absorb, and your smaller stomach results in weight loss. 3. Do You Qualify For a Gastric Bypass? If you have difficulty losing large amounts of weight and you have trouble keeping it off through diet, exercise, and behavior changes, or if your obesity causes serious health issues, you may be a candidate for gastric bypass surgery. Often your BMI along with health conditions like joint pain, diabetes, depression, and sleep apnea are used to determine if you are a good candidate for bypass surgery. Your surgeon and you will talk about the best weight loss options for you. 4. Is it Safe to Have Gastric Bypass Surgery in Another Country? Yes! Having gastric bypass surgery in another country is a way to save some money, and often get your surgery done much quicker than you can at home. It’s important that you do your research so that you make a wise choice, or use a Health Travel Guide who can find you a specialist, put you in touch with top bariatric and plastic surgeons, even arrange your rides, consultations and stay for the procedure itself. 5. What Are the Gastric Bypass Surgery Benefits? Gastric bypass surgery is a dramatic and rapid weight loss procedure. Generally, after gastric bypass, you will lose around 70% of your extra weight. If you have the gastric sleeve bypass you will lose about 60%, and if you have gastric banding, you can expect to lose about 50%. However, these percentages vary based on personal circumstances. After you have gastric bypass most patients tend to feel noticeably better and experience quick improvements in their obesity conditions like hypertension, diabetes, high cholesterol, sleep apnea, heartburn, arthritis, and asthma. 6. How do You Prepare For Your Gastric Bypass? Smokers should quit several weeks before their surgery and remain smoke-free after their surgery because smoking will slow your recovery and increase your risk of post-surgery problems. Your surgeon might also request you stop taking certain drugs. Your surgeon will tell you which drugs you can take on the day of your surgery. 7. What Risks Are Associated With Gastric Bypass? As with all major surgery, there are risks, and some are very serious. The biggest risk of gastric bypass surgery is the potential to develop leg blood clots (DVT) during the first 6-weeks following your surgery. The use of compression stockings and blood thinning drugs are used to try to prevent this from happening. Be sure to talk to your surgeon about the risks. Shrinkage of the opening into the intestine. Leakage at stomach and intestine reconnection sites. Your food is dumped too quickly into the intestines before being digested properly. This is fairly common and can result in nausea, vomiting, sweating, diarrhea, bloating, and dizziness. This can be beneficial in helping you to avoid the fatty and sugary foods that cause dumping and weight gain. While rare, blind stomach distension can occur. Treatment of distention is quick. With very quick weight loss, gallstones may develop. Gastric bypass surgery can be very beneficial, but it is not a magic bullet for solving obesity. To maintain your weight loss after your surgery you will need to strictly follow the eating regime your surgeon gives you and exercise regularly.